Poland’s journey from west to east takes thirteen hours and is getting longer every year. More cars imply increased traffic, while road surface of inferior quality needs constant repairs. The repairs are carried out in an absurd manner. This involves simultaneously digging up a dozen sections of the road and setting up roadwork only on selected one of the sections. Luckily we already passed Warsaw and we’re heading in the direction of Belarus. Traffic becomes lower with every mile, so is the number of inhabitants and any traces of civilization become less visible. Our road is passing through a wild forest. We reach the very far corners of the Podlaskie Province, near the eastern tip of Poland. Wilanowo is a small, forgotten village where my grandparents spent all their lives and my father was born. Local life goes here at it’s very slow pace. It’s such a timeless place. The area is home to storks, which are present not only in the distant meadows, but also stay close to people. In the village there are several nests, not without reason, because the birds are attracted by nearby ponds full of frogs. It is a beautiful place. Thatched houses, a forest on the other side of the road, fresh air, abundant spruces and flowering acacia trees, the smell of undergrowth and patches of wild berries. Going back it time these have always been here and I hope would always be. 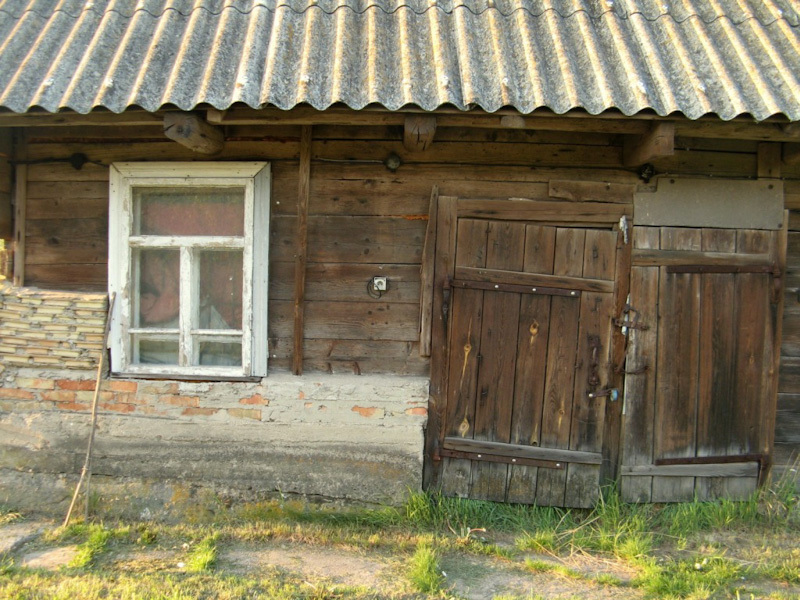 We visit a 87-year-old uncle who lives in the nearby village of Czeremcha. He is a bursting with energy and enthusiastic person. Today it happens my uncle to use a little support of cane, but still he rides his bike and uses every opportunity to have fun. Out sitting begins with loud singing and telling all sorts of past stories. There is no limits with our feast. “It is too much!” – someone says seeing the uncle filling a glass with vodka. “Too much may be on the top of a cart. Then it would fall!”– sums up the funny uncle, topping up the glass with vodka. The person of his age, despite many traumatic experiences in the course of his life, has by far more joy and energy than many thirty-some year olds tired with their everyday lives. With everyone in cheerful moods we go back to Wilanowo. The following day we go to Białowieża. Bialowieza National Park is the only place in Poland being a non-realization of a human thought listed on the UNESCO World Heritage List. In total, the park consists of over 100,000 hectares. Less than half of it is a strictly protected area, accessible to the public only with a guide. A three-hour guided tour with a number of interesting insights introduces us to valuable features of the park. We get to know excerpts of history of this place. Here were held the famous hunting sessions of great Polish kings. Also many battles took place here. The park is a habitat to over 1,000 different species of plants. I admire the unusual specimens of trees in their most pristine state. The highest level of the huge forest is occupied with some single spruces, slightly lower there are linden and oak trees. Some of the mighty linden trees have fallen to the ground as a result of death of their interiors. 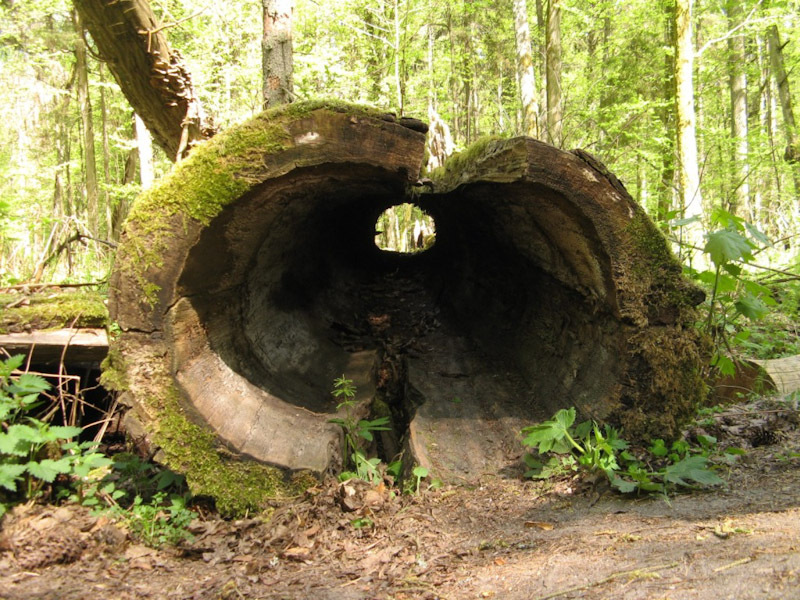 The famous Jagiełło Oak, whose age is estimated at more than 400 years, was knocked down by a great storm in the 70s. To this day, it lies and decomposes slowly with no human interaction. The diversity of fauna is increadible. Spongy mosses, lichen, fungi, mangrove vegetation with its intense smell of a damp forest act on most of the senses. We learn that numerous cones driven in bark of trees is a woodpecker job. It is a practical way to dig out seeds. Nature itself is capable of staying in a right balance. Afterwards we visit the Bison Reserve. Here, in captivity, although similar to natural habitat, we can see different animals that live in the Bialowieża Forest, like lynx, deer, elk and of course bison, the king of the forest. There are also another interesting, huge animals, bred by crossing a cow and a bison, however these are sterile in the second generation. In the forest there is over 450 bison. 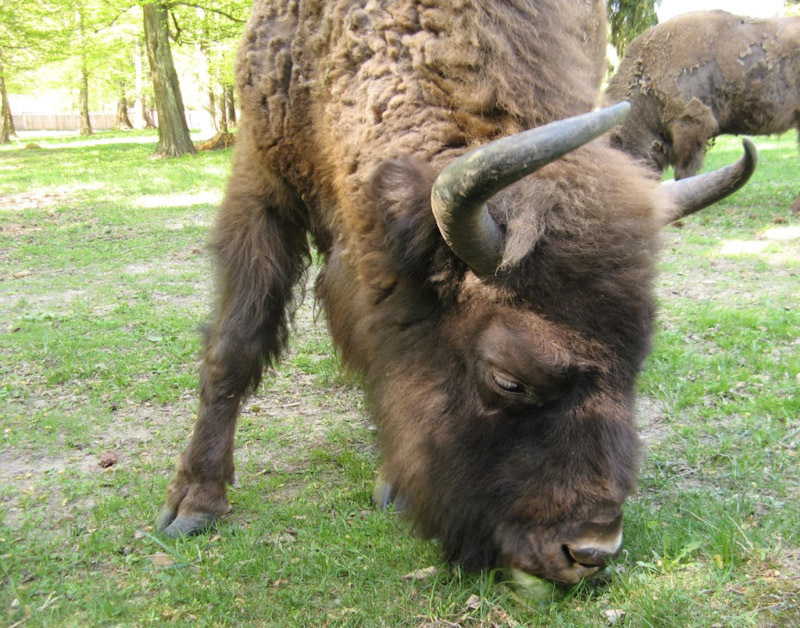 Including the European bison living in the park on the Belarusian side we add 900 specimens. This represents less than one third of world population. Due to numerous visitors it is rather difficult to see a bison at large. More lucky would probably be trying to see the animal early in the morning and just before dusk. At that time bison exhibit more activity, while for a fine part of a day they prefer to rest. Each season in the Bialowieza Forest has its own charm. Blooming, fragrant spring, deep, warm summer, beautiful golden autumn or winter with easy tracking of animals on snow.